Yes, it's that time of year again - violet season! My friend with the large and violet filled yard went the extra mile this year and brought me 2 cups of violets last week. Knowing I didn't have time to make the jelly, I steeped them in 2 cups of boiling water and then kept the whole concoction in the fridge. That was six days ago and today I was able to make them into jelly. I strained the violets, topped off the liquid with water to 4 cups, and then added 1/2 cup of lemon juice. This and a package of Sure-Jell pectin was brought to boiling and then I added 5 cups of sugar. When the jelly was done I had about 8 cups, which is two more than last year. Not sure what was different but sometimes that happens. I am canning 13 4-ounce jars and have the rest in a small container in the fridge for us. The 11 year old loves this jelly. And, with that, I have started the gift stash for this season. Yesterday and today were spent in a stressed out haze. At least until I completed my dessert and turned it in. This morning was our practicum exam. Each of us were to draw a card and then make what it said. As this was technically the mid term we were given the ingredient list and had to write out the method. Once Chef corrected it, we were to go into the kitchen and make it for presentation to the two tasters. There were eight cards and we knew what they were but we selected our actual card at random. Ahead of time, in addition to studying the methods, I thought about how I would plate each one. On a whim, I bought stainless steel martini glasses. Just in case I drew the macaron card. I drew the macaron card. Yay! The card stated that in addition to making three different flavors of macarons - coffee, lemon, and raspberry - we were to make an ice cream of our choice. Planning ahead again, I decided that a pear cardamom ice cream would go well with each flavor. That had to be made first. I made an ice cream base with pear purée, cardamom, and some pear brandy. While that chilled, I worked on the macarons and sautéed pears in butter, sugar, and more brandy. When it was time to put the ice cream in the maker, at the very end I churned in the cooked pears. It was lovely. The macarons came out better than they had any right to as we had some oven issues (the opposite problem compared to home, the ovens were too hot. Even though we set them 25˚ lower than usual). The tasters noted they were a little dry. I guess they crumble too quickly. Each one had a matching ganache. For plating, I chilled the martini glasses and put a scoop of ice cream in each. I had made mini macarons and stuck them on the ice cream. I made sure each macaron was between mini macarons of different colors - pink between yellow and brown, yellow between brown and pink, and so on. 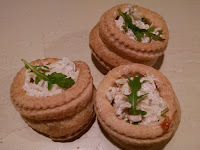 Ultimately, I did well on the kitchen part and I don't have the tasting grade yet but the comments were mostly positive. Now we only have the final written exam left! 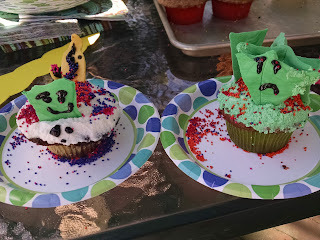 This year's birthday theme for the (now) 11 year old was mythical beasts. 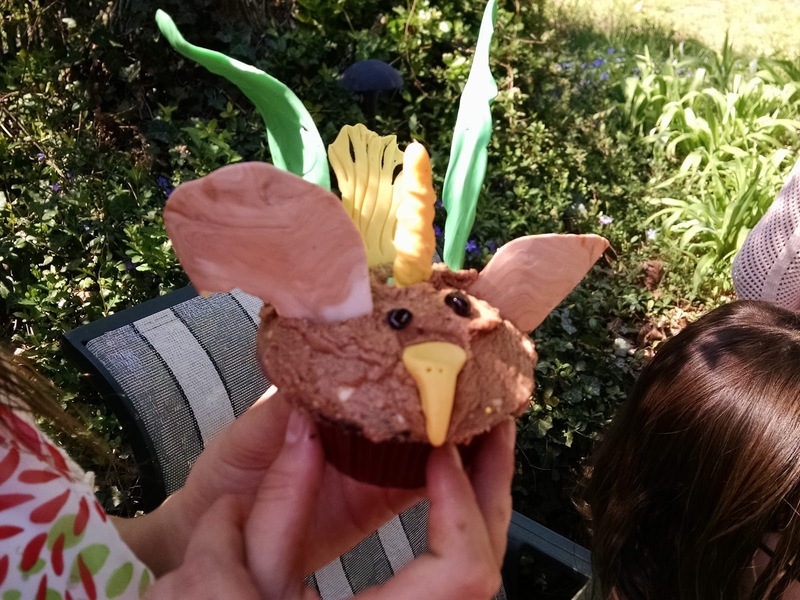 Dragons, Gryphons, and Unicorns. 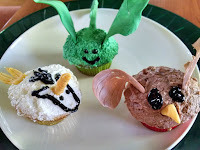 I dutifully made cupcakes with different color paper cups, different frostings and, with gum paste, various add ons. Wings, horns, beaks, tails. Sadly, my buttercream wasn't as smooth as I wanted it to be, but the kids did not care. However, despite the absolute cuteness of my demo-cupcakes, they refused to be constrained by tradition and created a variety of chimeras. Gryphicorns. Draggryphs. Unigons. Whatever. Then they unleashed the sprinkles. Yesterday we finished the other three classic cakes we'd started the day before. 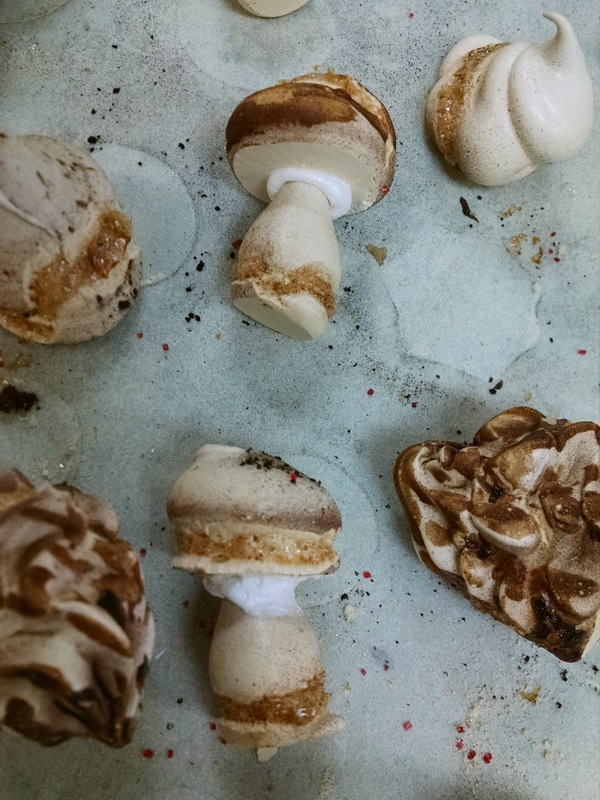 First, however, we trashed all the meringue flowers and mushrooms because the oven was too hot and they didn't look right. I was encouraged to make amanita mushrooms (fly agaric) instead. 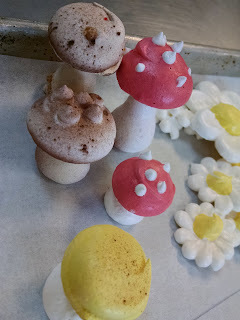 I made those, but I also had yellow and white meringue and cocoa powder so I made some yellow and brown mushrooms too. I also made white mushrooms, a la Destroying Angels (another amanita). After that cuteness was in the oven, we started the assembly of the black forest cake. First the vanilla and chocolate mousses were finished and the cake was built upside down. The top layer had the red pâte decor on it so it was soaked from underneath with cherry kirsch syrup and then the vanilla mousse was spread in a thin layer. Then there was a layer of cherries and a layer of chocolate mousse. Lastly, the other layer of cake was put in place and soaked with syrup. This went in the freezer to set up. By this time, the meringues were ready and we could get the rest of our Buche de Printemps decorated. 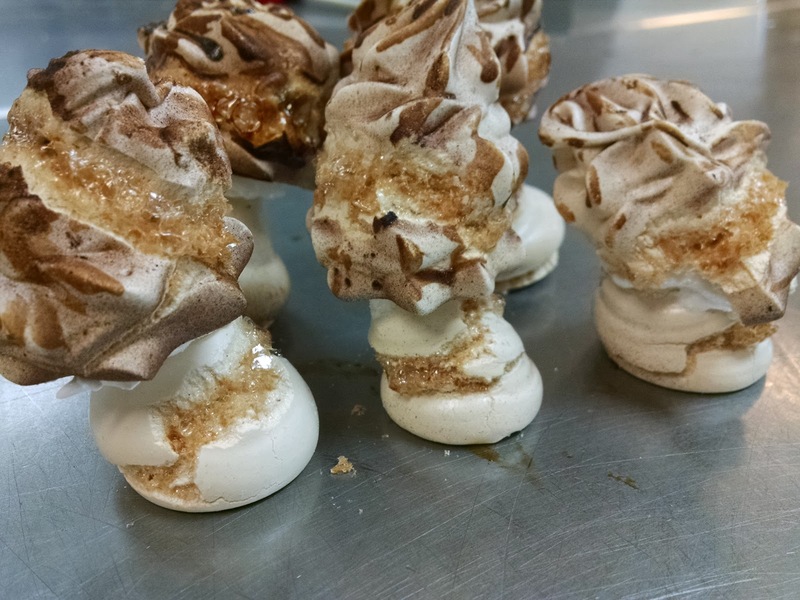 A thick meringue was applied to the logs and torched. Coffee macarons were made to simulate polypore mushrooms. "Plastic chocolate," aka chocolate for molding, was made in green and leaves were prepared for everyone. After a bit, we had all our decorations in place and we each assembled a log. At this point we were all overwhelmed by whimsy. 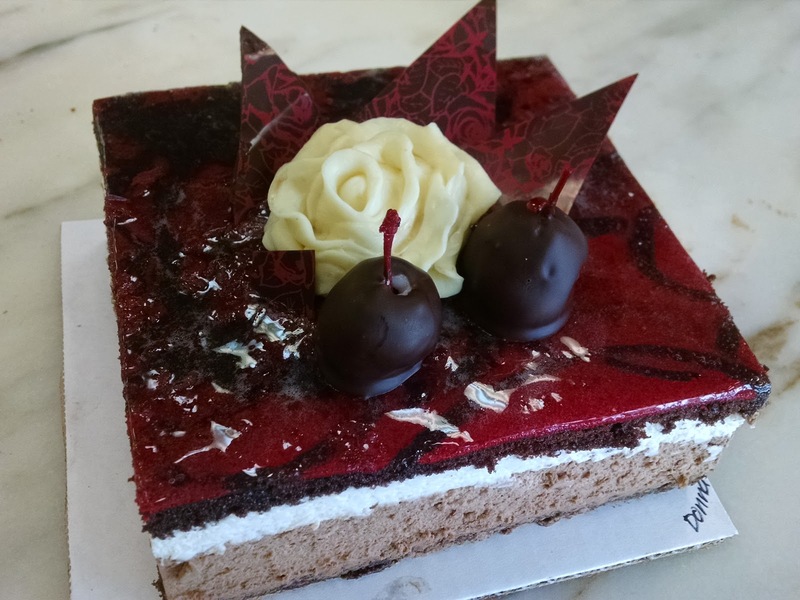 Throughout the day we also made things like caramelized hazelnuts and clear glaze and chocolate decorations and fondant into which cherries were dipped and subsequently those cherries were dipped in chocolate. Time flew. The Alhambra cake was cut into 12 pieces and then each was decorated with piped ganache, caramelized hazelnuts, and chocolate curls. The black forest cake was, by that time, ready to flip. Then came the really hard part, removing the silpat and leaving the red pâte decor in place. I realized after a while that it was a lot like dissecting so I ended up taking over and very slowly doing what I could to keep it neat. It was not easy and didn't come out as pretty as maybe it could have. We were able to cover a lot of it with the clear glaze and decorations. This is the last of the formal classes. Next week we have a review day and then the practicum. The final written exam is in 10 days. I'm amazed at how quickly the time went by and how natural it feels to be there in the kitchen. I feel very close to my classmates and I'm sad to think I won't be seeing them every week. I have laughed quite a lot in the last four months. Mostly at myself, which is healthy, but also with my new friends, and for the sheer fun and joy of it all. Today and tomorrow are devoted to the European classic cakes. We've already tackled Tiramisu but this week it's the Opera cake, the Sacher Torte, the Alhambra cake, Black Forest Cake and a "Yule Log" of sorts: a spring log. For most of these cakes we made the cake a long time ago. We only had to make the cake for the Black Forest cake. While my classmates made the red pâte decor and the chocolate almond genoise cake, I made ganache with 10 pounds (yes, TEN) of chocolate. In that crazy huge bowl we almost never use. Other things got made today. Lime mousse and raspberry syrup for the Spring log (Buche de Printemps). Chocolate glaze. Coffee syrup and coffee buttercream for the Opera cake. We were down a few students today so we had to stop a lot more often to clean up since there was the same level of mess and fewer hands to clean it. But ultimately we assembled the Opera cake and the Sacher Torte. The Alhambra is mostly assembled as well and the Buche de Printemps is rolled and waiting to be cut. Oh, and I made meringue mushrooms. 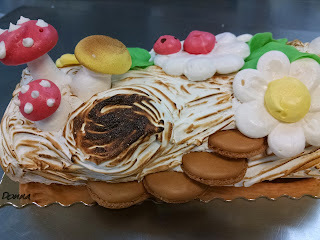 Meringue was made so we could have flowers for our Buche de Printemps but I also wanted to learn how to make mushrooms. After Chef taught me the basics I went a little crazy and decided to make morels. They're spring mushrooms, so why not? 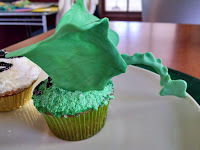 I grabbed a star tip and more meringue and piped taller, twisty peaks. After they dried a bit, I dusted them with cocoa powder and painted the edges with concentrated coffee. Unfortunately the oven was a little too warm so they split a little but they are adorable. At least, I think so! The Opera cake is seven layers: Joconde cake, coffee buttercream, cake, ganache, cake, buttercream and a chocolate glaze. It's the size of a sheet pan and then we each got a rectangle (nine cakes in total). Decorating is always a challenge for me and today was no exception. The Sacher Torte has ganache on the sides of the rings and then two layers of Sacher chocolate cake separated by apricot jam and ganache. It is topped with ganache and then with the chocolate glaze and finished with chocolate slivers. The rest of the ganache went to assemble the Alhambra cake which we will finish tomorrow. This is what I've been (not so) patiently waiting for: springtime, and the chance to check on the bees. And maybe even get some honey. I wasn't sure, you know, that there would be any for me to harvest. But the weather has been consistently good, the dandelions are blooming, and it seemed like time to remove the insulation panels and take a peek inside. After I got home from work yesterday I went out (gearless, mind you, although I wondered if I should suit up) with my tools and removed the insulation. Next I had to attach the hardware to put the window cover back. I hadn't been planning on getting in to check on the bees but my curiosity got the better of me and I opened up the hive. First I removed the fondant boards. They'd eaten through about half of one and almost none of the next. I set those aside and started looking at the combs. The first one I pulled out had a little honey but was mostly empty comb. The second was mostly capped honey cells. The third was the one in the photo - almost entirely capped honey cells and very heavy. I set them aside and peeked at a fourth comb. This one was also mostly capped on the back but open on the front. Figuring that was where the bees were feeding most recently I left that one alone. I moved the false back all the way to the back and moved an empty comb forward. 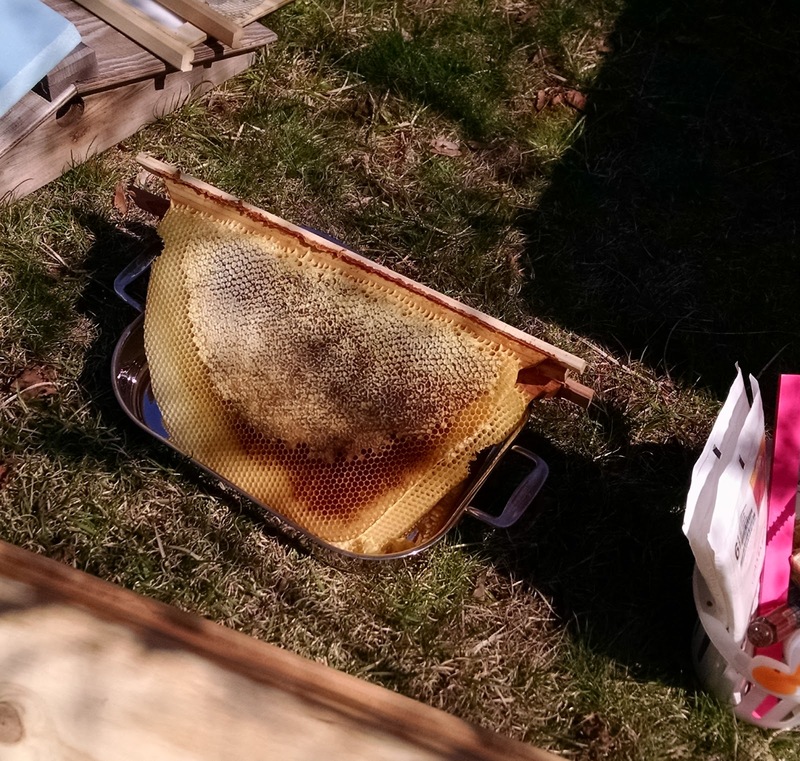 Then I closed up the hive and took these combs, surprisingly bee-free, into the house. Did I mention I hadn't been planning on doing this? 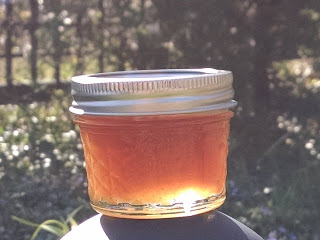 is the first jar of honey I've ever harvested. And without my gear! I'm so proud of myself for being brave/stupid enough to do that. Today the bees were very active, bringing in every color of pollen imaginable. Even that pretty blue. From the brioche dough we made purple spiral buns. The purple filling was almond cream mixed with black currant purée and they were divine! We also made peaches. 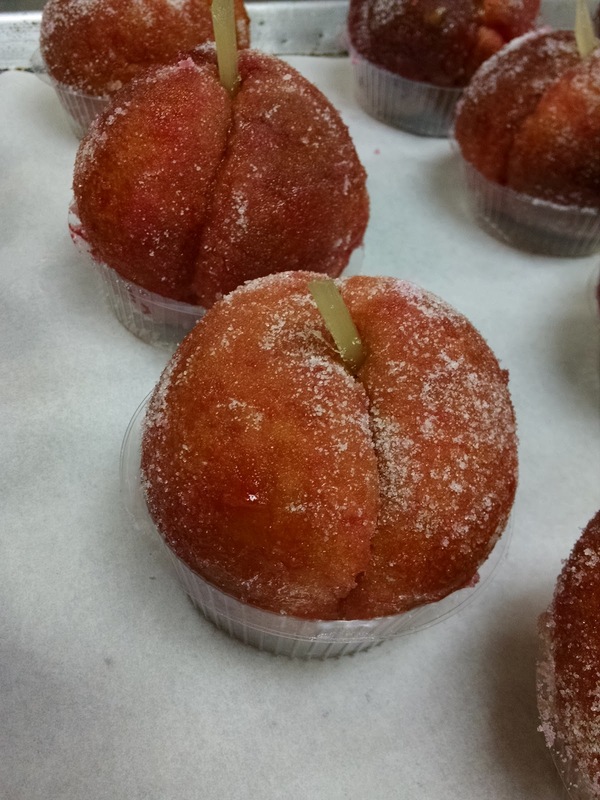 This is a specialty of one of the Chefs and involves brioche buns, peach pastry cream, and sugar. The buns are made to look like fuzzy peaches and they are adorable and taste terrific, too. Lastly, we tackled the puff pastry. Here we were allowed to experiment even further. I played it a little safe by making palmiers (elephant ears) again but I put cardamom in the sugar for rolling and folding and, for some, sprinkled almond flour in between the layers of the final shape. I wanted to see if I could approximate baklava. 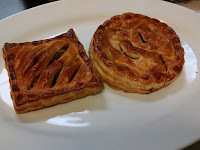 Not really, but the palmiers were fragrant and lovely nonetheless. We each got some puff pastry dough to take home. Mine is in the freezer and hopefully I can play with it soon. 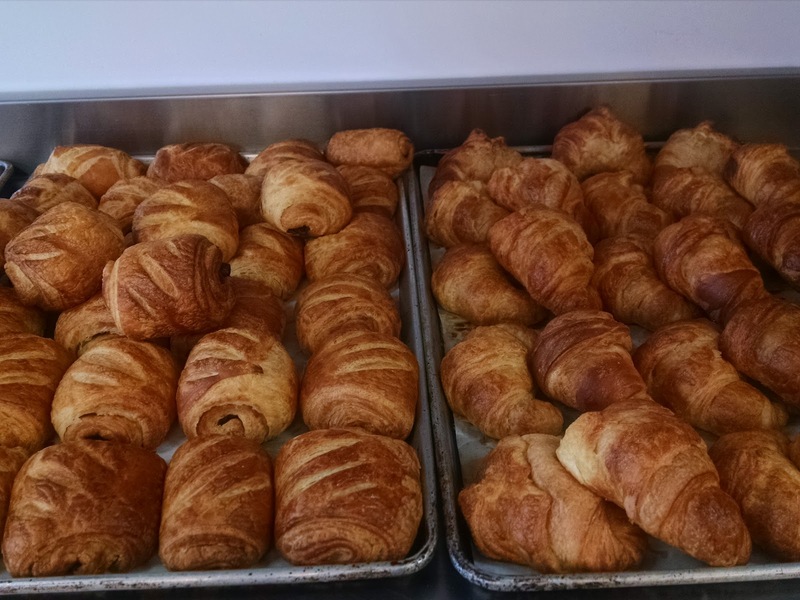 Last week when we each made a batch of croissant dough, we saved half of each batch for today. Danishes! But first, we had to make more dough for tomorrow: four batches of croissant dough to make eight patons, and eight batches of puff pastry dough, and a single batch of brioche dough. So, in between making various danishes, we made all the turns for all our doughs and got them ready. Tomorrow there will be more croissants and some other fun things as well. Then we got to work on the fillings for the danishes. We needed pastry cream, which was the base for the cheese danishes and the apricot ones, and a component of the pecan rolls (part remonce, part pastry cream). We also made a lemon filling. Each danish was a different shape. The cheese ones were squares with the corners tucked in. The apricot danishes were pinwheels. The raspberry ones were bear claws and the lemon ones were little baskets. Some of the lemon ones had raspberries on them and others did not. 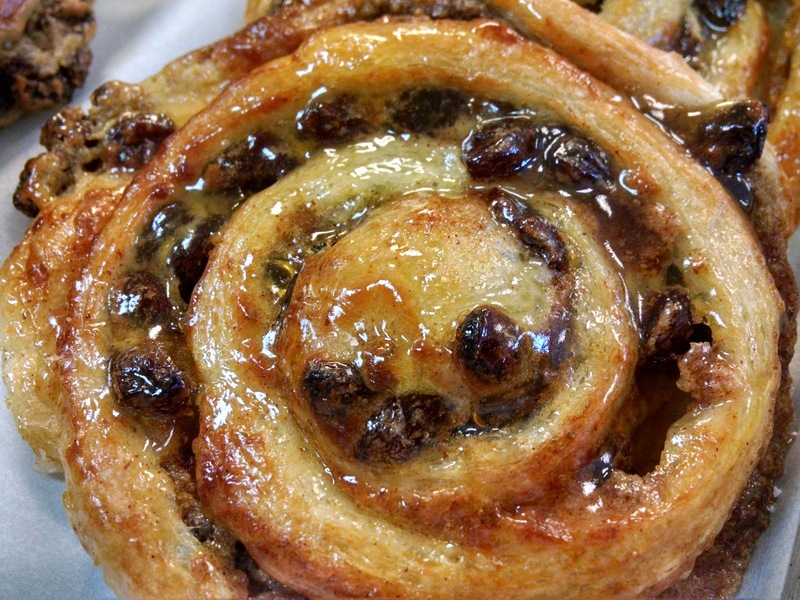 The pecan rolls involved strips of dough with the filling, twisted and then rolled into snails. Everything was proofed, washed with egg wash, baked and then glazed or dusted with powdered sugar or both. This week we didn't forget and with the scraps we made monkey bread. 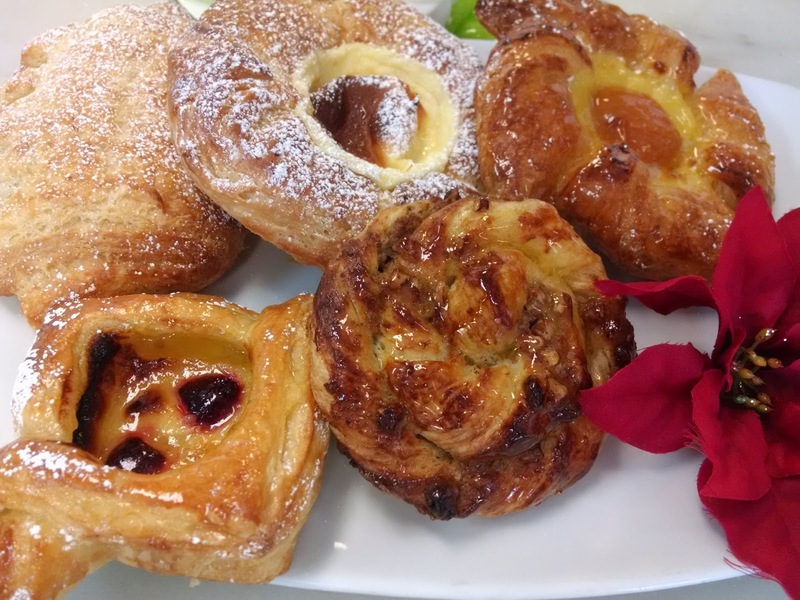 This week we started on Viennoisserie - croissants, puff pastries, brioche. Mmm. Lots and lots of butter. Monday was spent making the doughs - as they need to rest overnight, there was no baking that day. 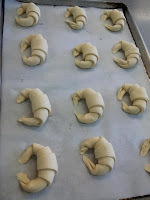 Croissant dough has yeast and puff pastry does not, but both need to have butter incorporated within them and then they go through a series of "turns" to make all those layers. First we had to start the croissant dough and let it ferment. 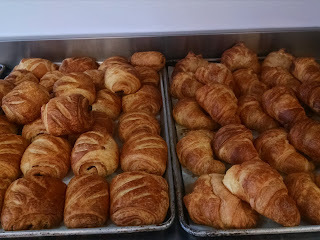 After that we divided each batch in half so we will have some to make croissants with next week as well. For the batch we were using, we started to incorporate the butter. We took the dough (detrempe) and rolled it out and then folded it over the butter, creating the paton. Then we rolled it out and folded it into thirds. One turn. Wrap and refrigerate for at least one hour. 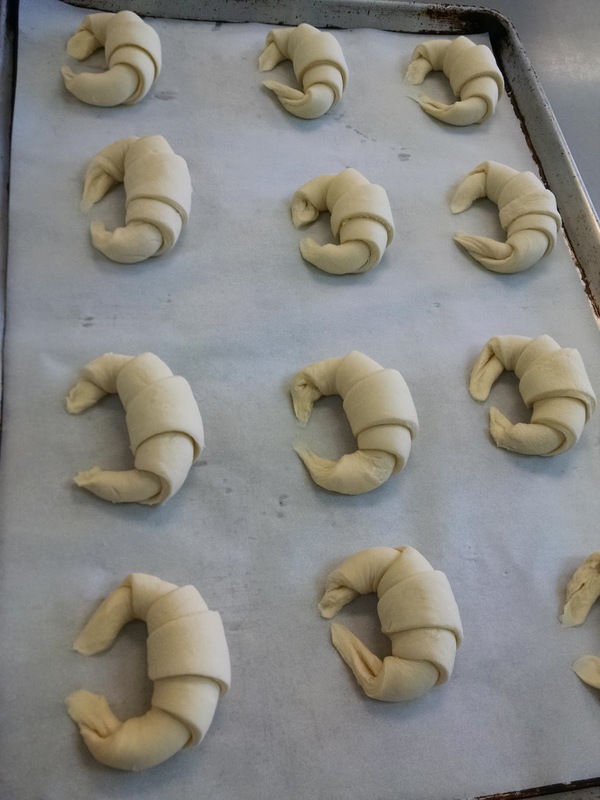 The croissant dough was turned 3 times over the course of the day. 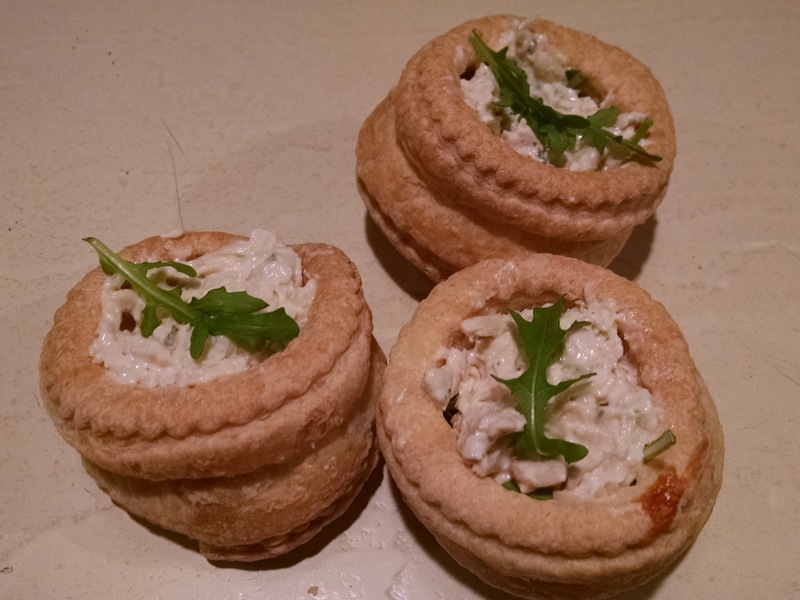 The puff pastry dough was similar except did not require fermentation. We did let the dough rest and then did the same thing. Roll. Fold over the butter and seal. Roll and fold. Puff pastry needs six turns; we did five on Monday. Then it was wrapped and chilled overnight. Lastly, we made brioche dough, one batch was enough for all of us. Instead of letting that dough ferment at room temperature it went right into the refrigerator and fermented slowly there. 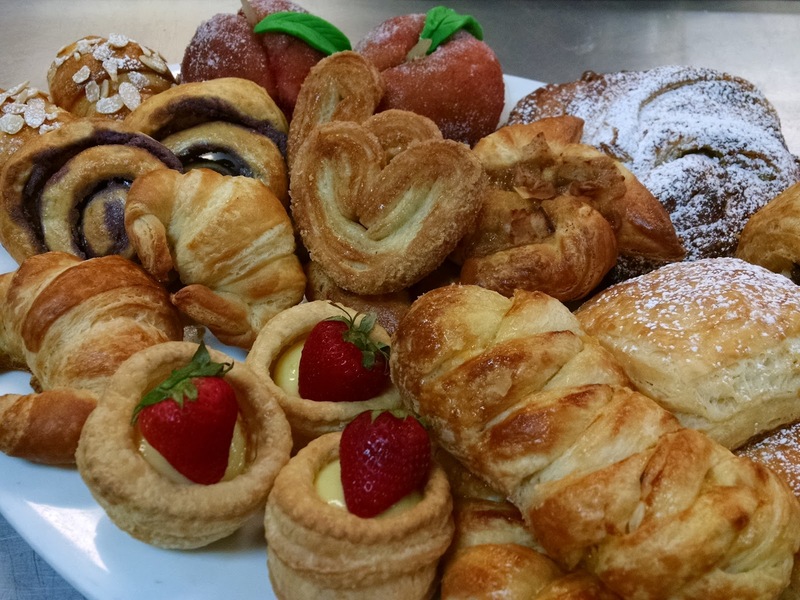 We also made pastry cream and almond cream so we would have that ready for the croissants. 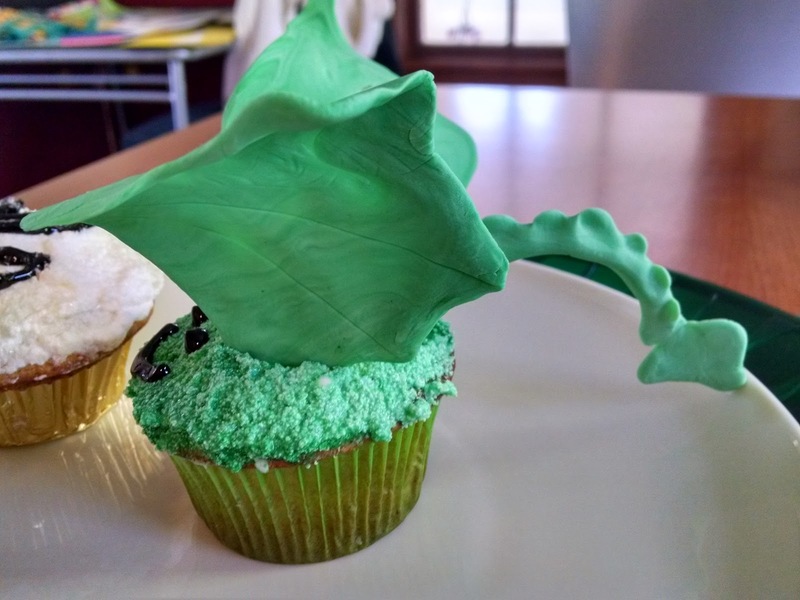 Yesterday was baking day. First we took out our eight patons of croissant dough, in stages. We made plain croissants out of three patons. Chocolate croissants with two patons, almond croissants (almond cream as the filling) with two patons, and cinnamon raisin croissants with the last paton. That last one was mine, it'd broken while I was rolling it on Monday and since it didn't need to be as pretty it was used for the raisin croissants. We took the scraps from making the croissants so I could make some mini plain ones for my project presentation last night; I set aside eight or nine and let everyone eat the rest. We saved more scraps to make monkey bread but completely forgot about it until the end of the day. There were plenty of baked goods to go around without adding anything else! The brioches were made into brioche a tête, in the little fluted molds. I'd tried this at home and didn't realize the little ball on top (the tête) was still attached. Now I know. They're adorable. 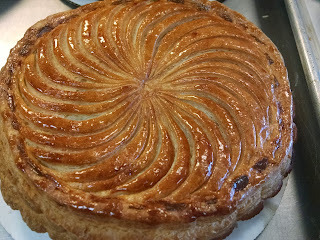 For the puff pastry, we used three patons to make pithiviers, which are rounds of puff pastry with almond cream inside and the top scored so the whole thing looks like a cake. 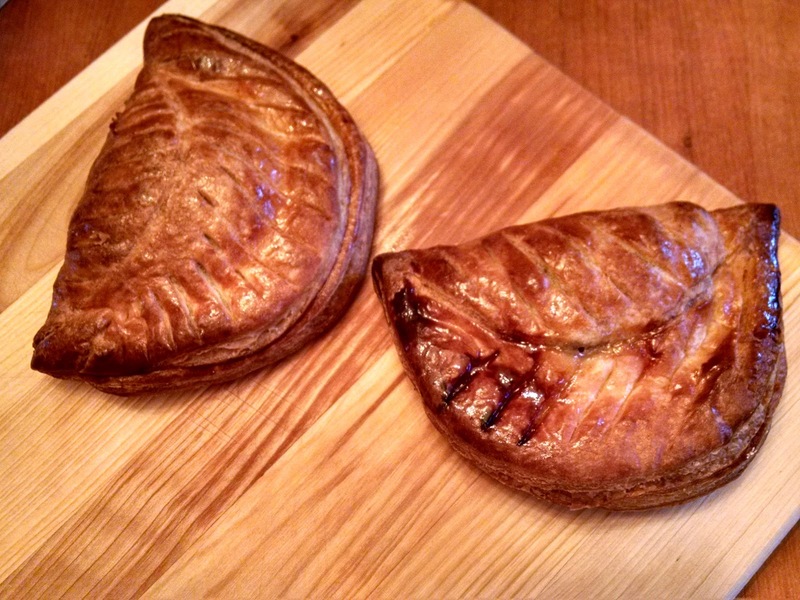 Two patons became apple turnovers with a filling of apples sautéed with sugar and calvados. 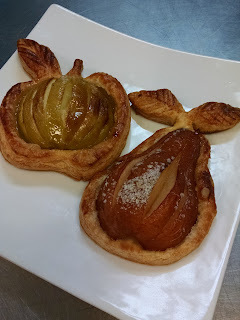 Lastly, the last three patons became palmiers, or elephant ears. For those, the last turn was in sugar instead of flour, which incorporates sugar between the layers and it's really wonderful. So, after coming home empty handed on Monday, I now have baked goods all over the house! Lastly, after our presentations at seminar last night, Chef taught us a bit about champagne and sparkling wine and showed us how to open a champagne bottle with a sword. "The dramatic way," he said. So true! My name was pulled out of a bowl so I got to open the second bottle with a really old German sword. Crazy fun! Nope, not a pun. It was 70 degrees out today and the bees were out and about. The elderchild and I went out to watch them after I got home from work. They still seem to have honey stores and a lot of fondant left. I had been planning on taking off the insulation and removing the fondant boards this coming Sunday but now they say it will be rainy and cold so we'll be postponing that a week or two. The bees were bringing in bright yellow pollen, likely from dandelions, and BLUE pollen. I'd been hoping I would get to see this. Blue pollen comes from Siberian Squills, those pretty little blue flowers that come up just after crocuses in the springtime. I even planted a bunch of bulbs last fall because I wanted to have some around EXACTLY so I could see the bees bringing blue pollen home. Well, it worked. And they came in with their pollen sacs positively laden with bright, rich blue. I wish I'd had my cell phone with me; I would have taken pictures!